Today is the first calendar Monday on my new Passion Planner. I’ve had it for over a month now, but the only thing I’ve actually written in it is my name and contact info on the cover page, and some birthdays and up-coming events on the monthly spread pages. I love new planners. To me they represent a clean slate, new beginnings, and a fresh chance to get organized. I really am a sucker for a nice notebook, and this one is really nice. I’ve tried lots of different systems over the years to keep track of tasks, appointments and what-not. Everything from self-made notebooks to the most basic appointment book available at the big box store has made its way into my life. 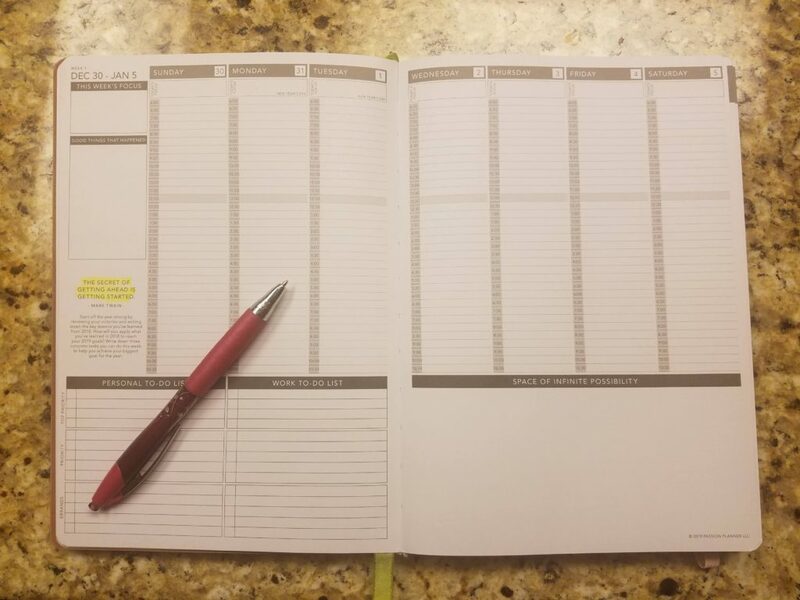 I have to say that some have been better than others, but I am still in search of the Practically Perfect Planner for me. The challenge now is that I am currently wearing lots of different hats that I need to change out several times a day: homemaker, Nana, part-time employee, small business owner, teacher, blogger, and beekeeper. My priorities are hard to keep in order as I find myself getting pulled back and forth between urgent things and demands on my time. Because I mostly work from home, the appearance of having plenty of time to handle stuff can be very deceiving. 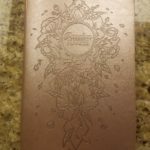 The Momentum Planner https://www.productiveflourishing.com/momentum-planners/ is what I used last year, and although it is a good system, I found that it is geared to a more corporate-style schedule than I typically maintain. Also, I had to print out the blank pages every week, which was pretty much a pain. Also, I never did get them punched and bound into a single book, so that left me with pages scattered everywhere. I did like that it had a good workflow of breaking big projects down into smaller tasks, which is something that helped me not get overwhelmed by big jobs. The basic little appointment books are efficient, but don’t provide enough detail for me. Also, they rarely hold up well over the course of a full year, so I find myself shopping for a new one when the only ones I can find are for the next year. Not good. Have you tried the Darren Hardy Sunday planning system? Nope, didn’t work for me, although I did like the concept of four main goals each year- influence, relationship, income, and personal. And the idea of taking a few minutes on Sunday to plan the week ahead is a great principle to follow. 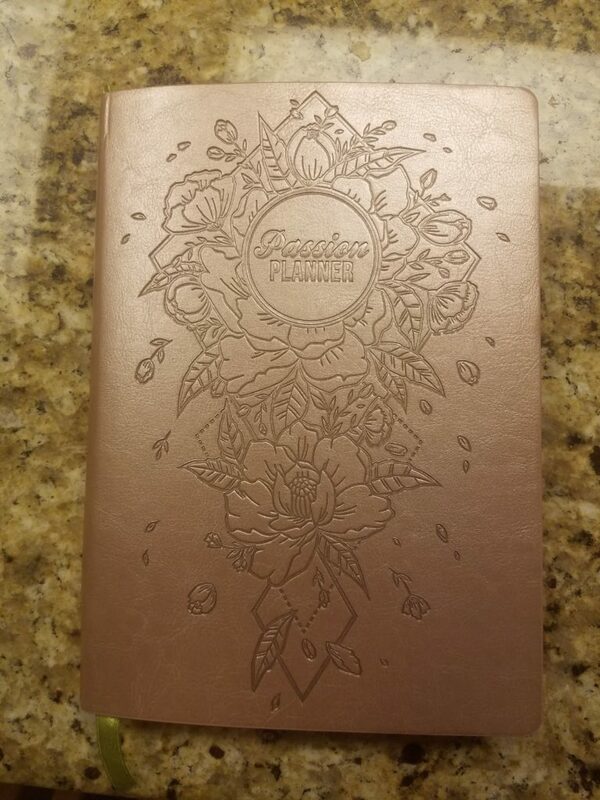 As you can see, I have looked at several different planners for 2019, and have finally settled on the Passion Planner. 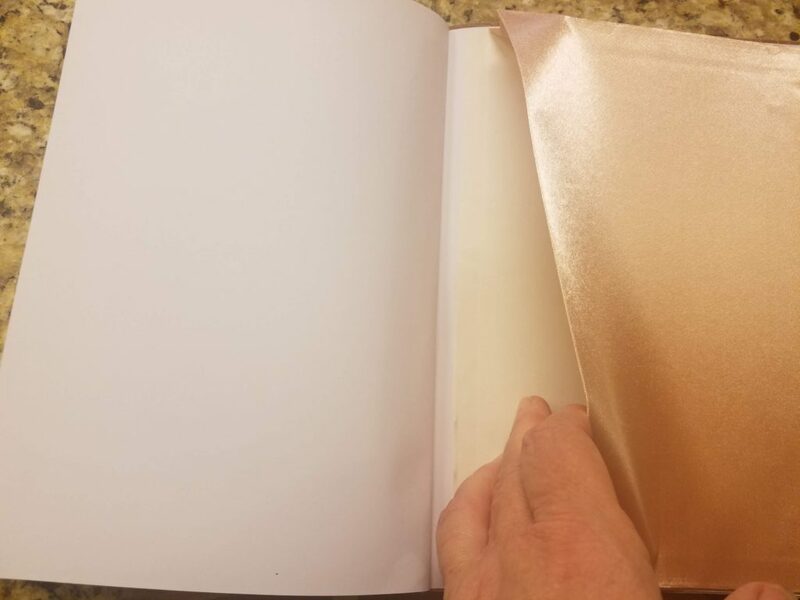 It is a beautiful book, and the paper is luxurious! It has a spread for each week with days broken into 30-minute segments spanning from 6 AM to 10:30 PM, and a 2-page calendar spread for each month. That weekly spread has lots of space for detail, like a personal to-do list and a place to write down priorities for the week, along with an inspirational quote. I also like that the Passion Planner incorporates some of the things I really loved about my Bullet Journal. https://bulletjournal.com/. I enjoyed the custom things I could track by creating a spread on the blank pages of my journal , and was pretty consistent with it for the year I used it. I am looking forward to re-creating my savings, weight loss and gratitude trackers in this journal as well, because it has LOTS of blank and grid pages at the back. 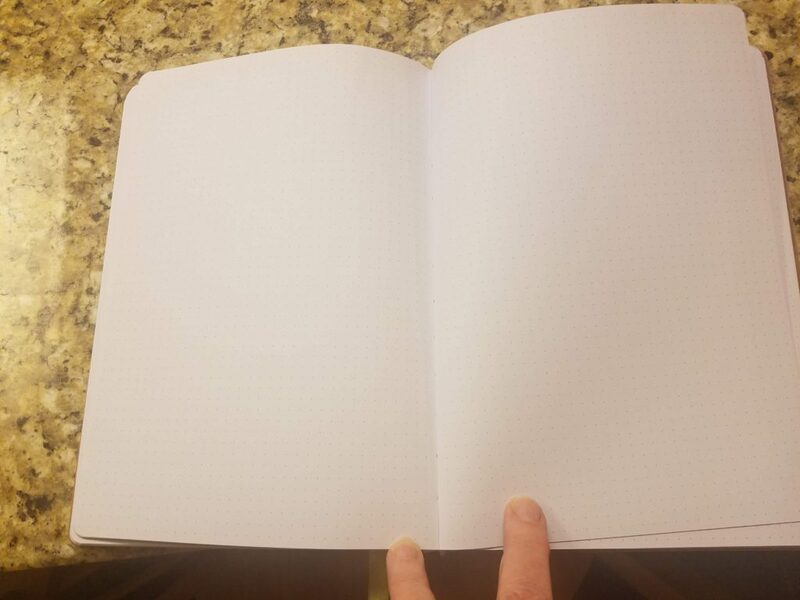 Nearly 20% of the pages are blank! The thing I didn’t like about the Bullet Journal was having to draw out the monthly and weekly calendars all the time. You know if I had a problem printing Momentum Planners once a week, this was a real issue. So I found myself skipping whole weeks and sometimes months on the calendar. 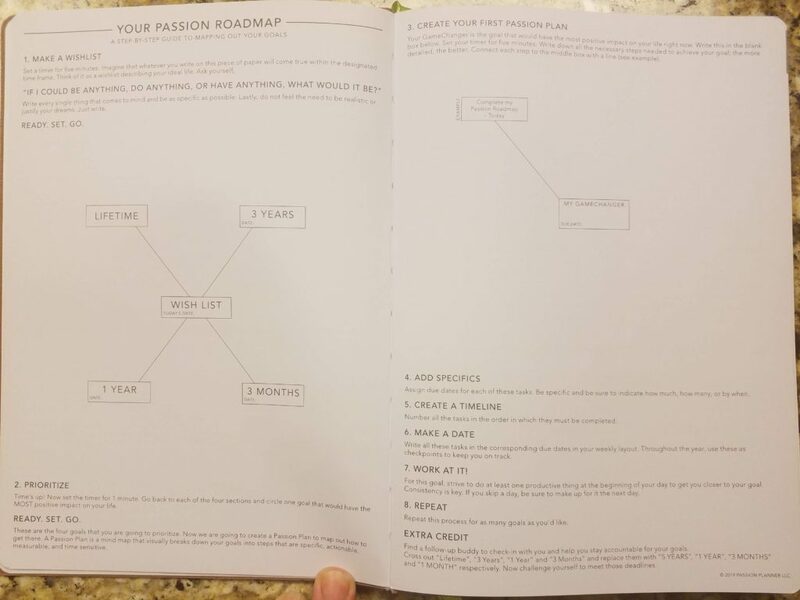 A unique thing about the Passion Planner is that it incorporates a “Passion Roadmap” which prompts you to map out goals and dreams for 3 months, 1 year, 3 years and lifetime. It then ties those goals to monthly reflections and checklists as well as weekly goals. Really great stuff, and sounds like just what I need to get my priorities in order and keep my focus where it needs to be, right? There is NOTHING WRITTEN ON IT! It’s not that I have no dreams and goals, because I do! Tony and I talk about our dreams all the time. I can’t figure out why I’m having a hard time with this little exercise. There is the issue of distilling down into a few words the things that I have dreamed about at length. But I am a writer, and that task shouldn’t give me much pause. Words are what I do. There is also the issue of breaking down long-term goals into smaller segments. Setting myself a 3-month plan that fits into a 1-year goal that becomes a 3-year goal, and so on. That shouldn’t be so overwhelming to me, but for some reason it seems to be. Maybe it’s really because filling in this little chart makes my commitment very permanent on some level. Having it written there, holding me accountable for my daily actions in pursuit of my goals may be something that I am hesitant about on some level? Doesn’t seem too hard, does it? Ready. Set. Go. I haven’t figured it out yet, but I will. Today I have a day off without distraction. I can turn off the TV and the phone, and get myself quiet so that I can focus after a hectic Holiday season. I will figure out how to put into words all the things that are in my heart and put them down on paper. And I will make the commitment to be accountable to that plan- at least until the middle of the year when my planner gives me a whole new blank Passion Roadmap to make revisions! Because that is the beauty of goals and plans. Even when they are written down on paper, they are NOT written in stone. Goals and plans can, and should, change from time to time as our lives unfold, and as God reveals another step in our life’s journey. I’d like to hear what you are resolving to change about your life in the new year. Have you made goals for yourself? Do you have a plan to accomplish them? Will you come up with one action step that you plan to do and share it with me? I would love that so much! Blessings to you and your loved ones in this New Year 2019! Organized and a little apartment set up so I can have my guest room/sewing room/exercise room back. 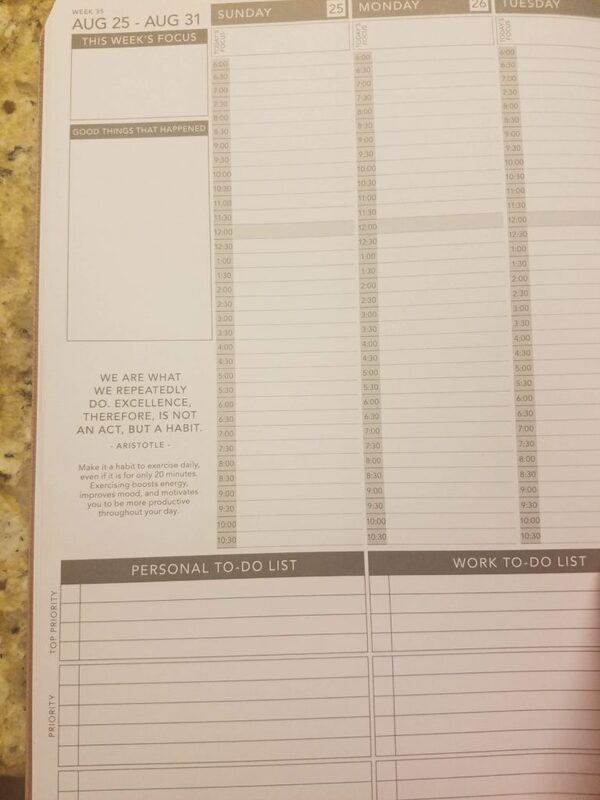 Your idea of a planner is a good one. I’ve been considering this planner as well. It’s actually in my Amazon cart. 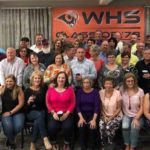 Thank you for the post!!! I want to get it now. Darlene, Alycia actually recommended it. She is beginning her second year of using this one. Let me know how you like it if you try it! You’ve inspired me, thanks Christi! Aw, thanks, Renee! Always glad to inspire! I have the hardest time finding a good planner. So many of them I see makes me feel like I’m doing way more extra work than needed. I am still looking for that perfect one. Anncie, I don’t believe there is a perfect one, just one that does what I need without being too complicated, lol! Thanks for the comment, and Happy New Year to you and John! What a cool planner! I love how the to-do lists are divided into personal and professional. And the fact that they allow for prioritization is even better. Thanks for sharing, Christie! Hi Brooke- thanks for dropping by! I think that little list is one of my favorite features, as well. Definitely something that I will use consistently. 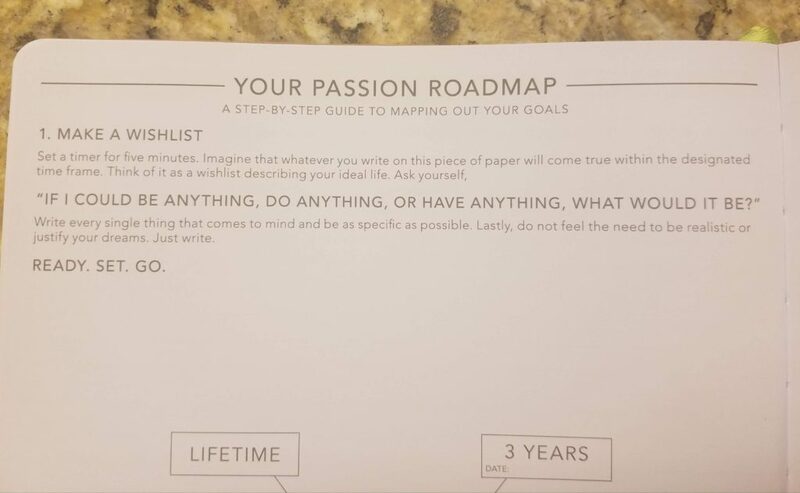 I STILL haven’t filled out the Passion Roadmap, though. I appreciate your feedback!